La Badia Orvieto. 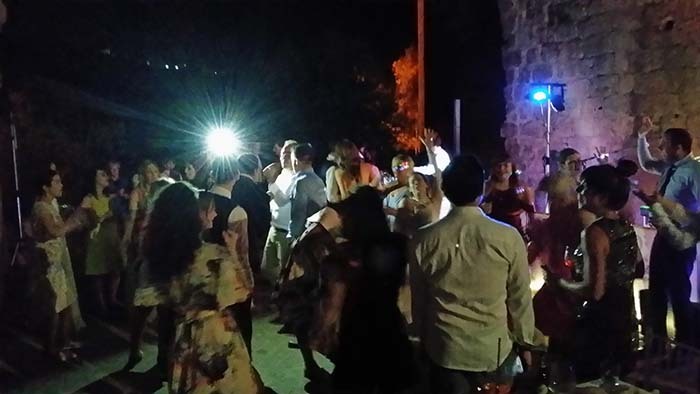 This video has been recorded on last August during an English wedding at La Badia di Orvieto; the young couple, Gabriella and James, together with their large group of guests – around 140 people!!! – have the ceremony in the front garden near the big tower, the aperitif in the courtyard in front of the hotel restaurant, the dinner and after dinner in the archway in front of the amazing view of Orvieto the cutting of the cake being in the courtyard (this is when the Hotel staff moves the tables in the archway to make way for dancing). Both LIVE and DJ set are provided by Guty & Simone “the Italian wedding musicians and DJ”!!! 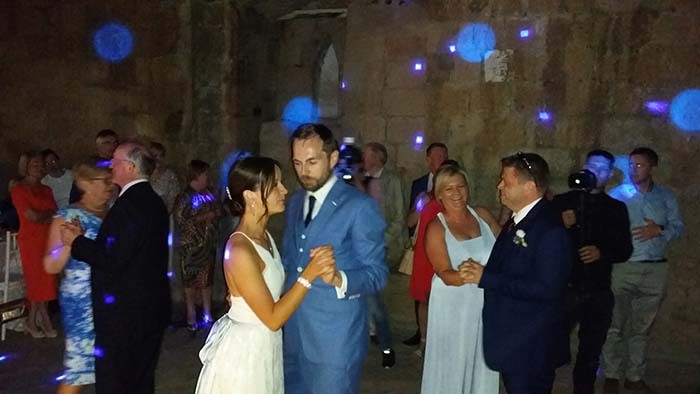 A friend of the spouses is singing the song for the first dance – “River” by Leon Bridges – being accompanied by Guty & Simone on guitars and background vocals; Guty & Simone have have just learnt it expressly for the bride and groom to perform it during their wedding. La Badia di Orvieto is a beautifully restored 11th century abbey, the hotel is a very silent and cool place, has one of the best views on the rocky city of Orvieto, the hotel itself is a bit out of town, a quick 5 minute taxi ride; it has large grounds that you won’t find in the city center, even has a pool and also is offering a free wifi connection to the clients; it’s fun exploring and being in an old castle, when you arrive there it feels like time-travelling back to the eleventh century!!!! The wedding setting in a 11th century former monastery in La Badia di Orvieto is quite spectacular, especially in summer dining outside as the evening progresses, and the colonnade and facade is brought to life by lighting. During the stay you can organize a trip to the amazing village of Civita, itself perched on a mesa in a sandstone valley behind Bagno Regio, and then a quick visit to Bolsena on the lovely lake.